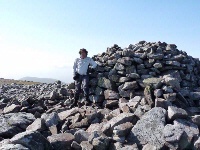 Carn nan Gabhar has an elongated summit orientated SSW to NNE. The summit is stony with boulder slopes on both flanks of the summit ridge. W of the summit are steep slopes with crags, and crags continue on the steep E flank of the N facing ridge. Crags also occur on the N face of the short NW ridge. 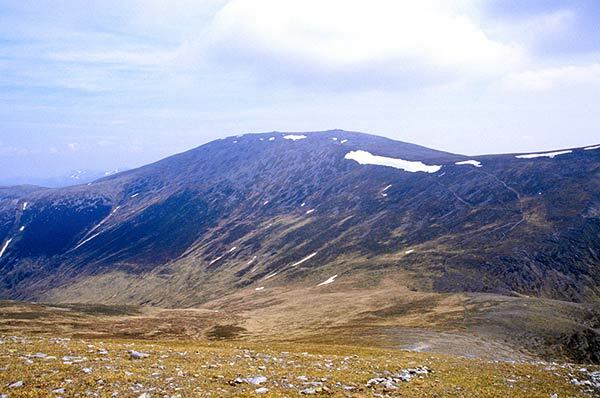 To the SW, the summit ridge connects to Airgiod Beinn (an access route) and there is a short W spur leading down to a bealach connecting to Braigh Coire Chruinn-Bhalgain, which is the main access route. Lower slopes are deep heather and the upper slopes grass with stony/boulder areas. Carn nan Gabhar (Beinn a`Ghlo) seen from Mam nan Carn looking over the south shoulder of Carn an Righ. Carn nan Gabhar seen on the descent of Braigh Coire Chruinn-Bhalgain. The summary information of one or more ascent routes that include Carn nan Gabhar. 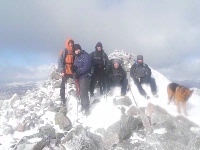 1 1480 m 22.38 km 7 hrs Carn nan Gabhar, Braigh Coire Chruinn-Bhalgain and Carn Liath Beinn a' Ghlo is a classic route on moderate heather/grass slopes leading to stony summits. This complex mountain could be difficult to navigate in poor visibility. Roy and John. Weather getting bad. Our usual weather! Post a few words about Carn nan Gabhar or read what others have had to say. To make this a big day and take in the Corbett of Ben Vuirich after completing the Munros. Decend the SE slopes of Airgiod Bheinn to Allt Coire Lagain burn and climb up to the top of Stac nam Bodach (672m) and across peat bogs to start the ascent of the Corbett Ben Vuirich (903m). Head back down the hill towards Loch Valigan (keep it on your left), hurdling over numerous peat bogs on the way. Follow the Allt Loch Valigan burn back to the main track in the valley and take this back to the start. The whole walk took us 11 hours to complete. 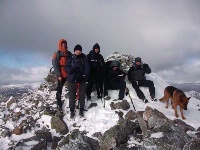 Climbed on 22/7/10 as the final summit of the day. After descending Braigh Coire Chruinn-bhalgain this ascent was probably the easiest of the day. 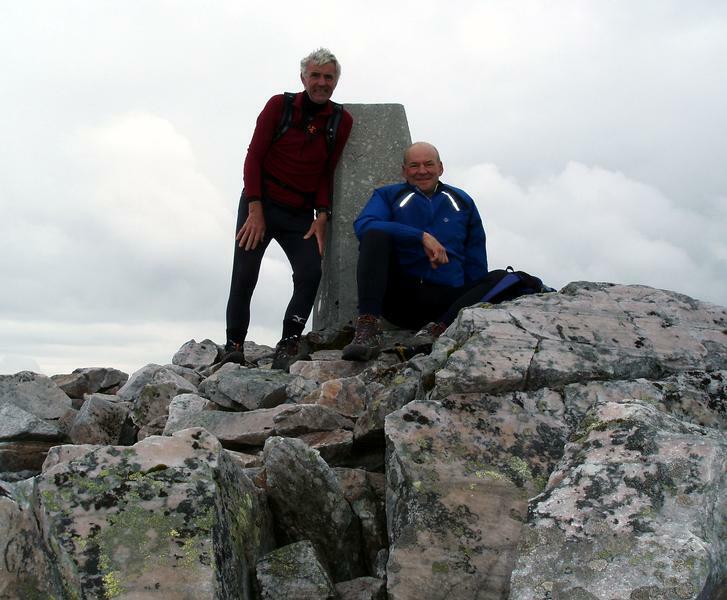 The Schiehallion-esque summit boulderfield did nothing for me, but again the summit views more than made up for this. After discovering that this top also had a wasp or two, I quickly returned to the bealach and took the long trudge back. The path I was on soon disappeared and I could now clearly see another across the river, but opted to cross lower down. A long day, but glad to have done it. Noticed that most of the summit photos on this site show the trig point. 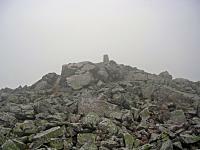 The real summit is the large cairn a couple of minutes walk NE of the trig point. 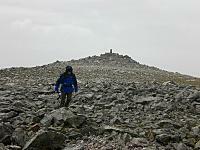 The way off the summit of Braigh Choire Chruinn Bhalagain in poor weather isn't clear. My friend and I continued too far along the ridge and ended up skirting back round the mountain to find the path that carries onto Carn nan Gabhar. When we reached the summit ridge of Carn Gabhar the weather was easily the worst we'd had to deal with on the mountains for this time of year with what must have been hurricane force winds!! 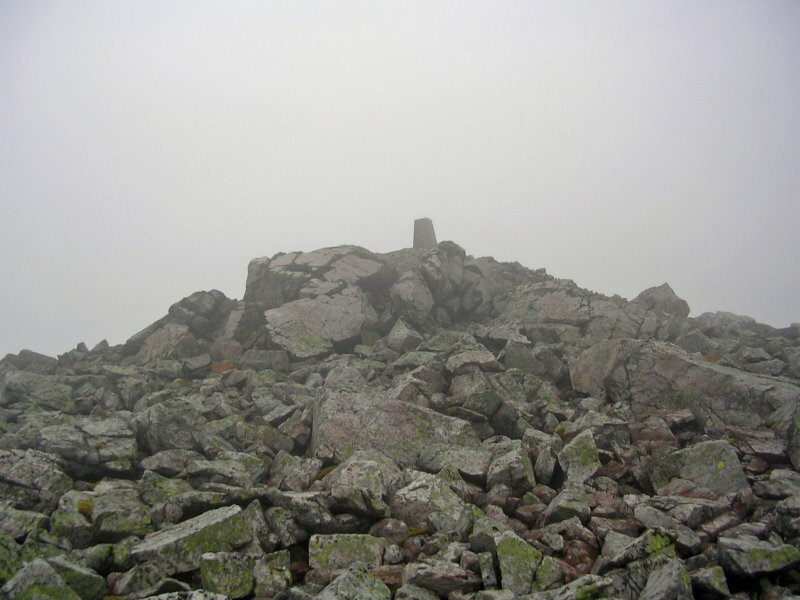 Pass over the large cairn (which at first we thought to be the summit), then past the trig point and eventually onto the summit cairn. Long path back to Monzie car park.